Directorate of Forensic Science Assam Recruitment 2018 | Scientific Officer posts :- Hello everyone. DFSA Assam i.e. Directorate of Forensic Science Assam has recently published a job notification in the month of July 2018. 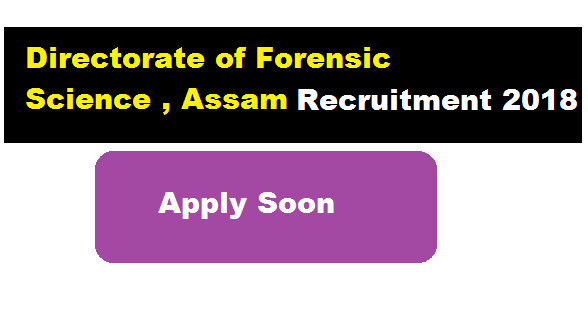 According to the latest Directorate of Forensic Science Assam Recruitment 2018 , Application are invited from the eligible candidate for filling up the following posts under Govt. of Assam in the DFSA Assam, Kahilipara,Guwahati-19 on contractual basis for a period of 7 moths with fixed monthly remuneration mentioned against each posts. In this section, we will discuss in detail about Recruitment of Scientific Officer Posts under Directorate of Forensic Science Assam Recruitment 2018 with all the details and requirements. Educational Qualification: Candidates should have a B.Sc. degree with Chemistry as one of the subject. Experience: The candidate should have at least 10 years working experience as a Scientific Officer or above. Experience: The candidate should have at least 10 years working experience as a Scientific Assistant or above. Educational Qualification: Candidates should have a B.Sc. degree with Chemistry or Physics as one of the subject. Educational Qualification: Candidates should have a B.Sc. degree with Physics as one of the subject. Experience: The candidate should have at least 10 years working experience as a Senior Scientific Assistant or above. Educational Qualification: Candidates should have a B.Sc. degree with Physics or computer scince as one of the subject. Educational Qualification: Candidates should have a B.Sc. degree with Physics or Computer Science as one of the subject. Age Limit : Candidate with 67 (sixty-seven) years or less as on 01.01.2018 will be preferred for engagement. Note : The application form should contain the self-attested Certificates in respect of Educational Qualifications, working experiences etc. The application form can be collected in the office of Directorate of Forensic Science Assam, Kahilipara, Guwahati 19 during office hours or it can be downloaded from the website www.assam.gov.in. 1/ The applicant must have good knowledge and experience in the particular field. (Necessary/supporting documents have to be enclosed). 2/ The appointees will have to examine and report cases assigned to them and will have to depose evidence when summon by the concerned Court. 3/ The contractual period will not make the person eligible for permanent absorption in future. 4/ The period of contractual employment will be initially for 7 (months), which may be extended. 5/ The appointees will not be entitled any other allowances/ benefits or concessions as admissible to the state Government employees other than the consolidated pay fixed per month. 6/ However, the appointees will be eligible for T.A./D.A while visiting court for deposing evidence. 7/ No application fee is required. 8/ Candidates will have to submit separate application for separate post.